Tim Armstrong stepped onto the stage and the crowd nearest to the stage raved. Like lightning, more people looked to the stage and realized the band was coming out, ran as one from the back of the complex to get as close as they could. The first hi-hat hit was struck and the accompanying guitar strummed as Tim Armstrong spoke the familiar words “Never fell in love, till I fell in love with you…” and a circle pit erupted instantly, some 400-500 punks strong. The band surprisingly and unsurprisingly rocked out for over an hour. Surprising on one hand that to the contrary of what many older non-punks say such things like the old school bands being passed their time and should quit, but unsurprising (and almost expected) at the size of the crowds these older and legendary bands draw, and the energy and love for the music they play. It was not a surprise at all to see 40-50 year olds in the crowd, on the edge of the pit with foggy glasses as they danced to one of the bands they grew up with. 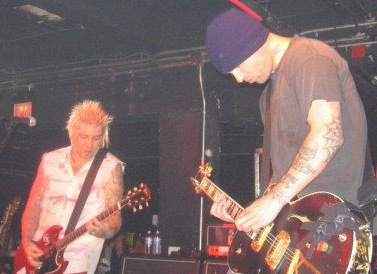 Rancid rocked out such familiar songs as Radio, Fall Back Down, The Wars End, Nihilism, Gunshot, Time Bomb, Bloodclot, Antennas, and a myriad of others. This entry was posted on Wednesday, September 10th, 2008 at 3:06 PM and is filed under Music Events, Punk Music. You can follow any responses to this entry through the RSS 2.0 feed. You can leave a response, or trackback from your own site.